Oregon's Mt. Hood Territory is home to great shopping options, from full-blown malls with all the big names, to local shops featuring unique gift items when you want something special. If a child on your shopping list is into farm toys, the head over to Haider Farm Store. In addition to gifts for the whole family, they have a wonderful selection of one-of-a-kind farm toys like tractors, trucks and other machinery, among others. There's some really fun stuff that you won't find at big box stores. We all have that one family member who seems to spend so much of their time in their garden. For that person, go to Tollen Farm to choose from a huge array of garden art and decor, trellises and arbors and even furniture. If you know a foodie or home chef, check out Our Table Cooperative to get them some great local, organic ingredients. It's the gift that comes back, because hopefully they'll use them on an incredible meal and invite you over to enjoy it. For the true Christmas lover in your life, you'll want to shop at Christmas at the Zoo in Oregon City. It's Christmas year-round at this charming shop located in Oregon City's mainstreet district, and the options for unique, hand-crafted ornaments is seemingly endless. Dozens of Christmas trees are set up with beautiful adornments, many of which can be found only in this very store. They also have a great selection of plush animals, with better wildlife diversity than some zoos I've been too. Oh wait, I think I just figured out the name. For a truly fun and "retro" shopping experience, head over to Milwaukie's Main Street Collectors Mall & Soda Fountain. Located in their historic downtown district, this eclectic shop hearkens back to yesteryear with it's soda shop. But the real fun comes in its many collectible gifts. From Legos to GI Joe, Star Wars and Star Trek and many others, there's a huge selection of gifts for the geek or collector in your life. I'm hinting here people, just in case anyone is looking for something for me. Nearby is another perfect option for unique gifts, Molly Muriel Apothecary. Handmade soaps, essential oils and beneficial herbs make ideal gifts for that person in your life who loves to live natural. 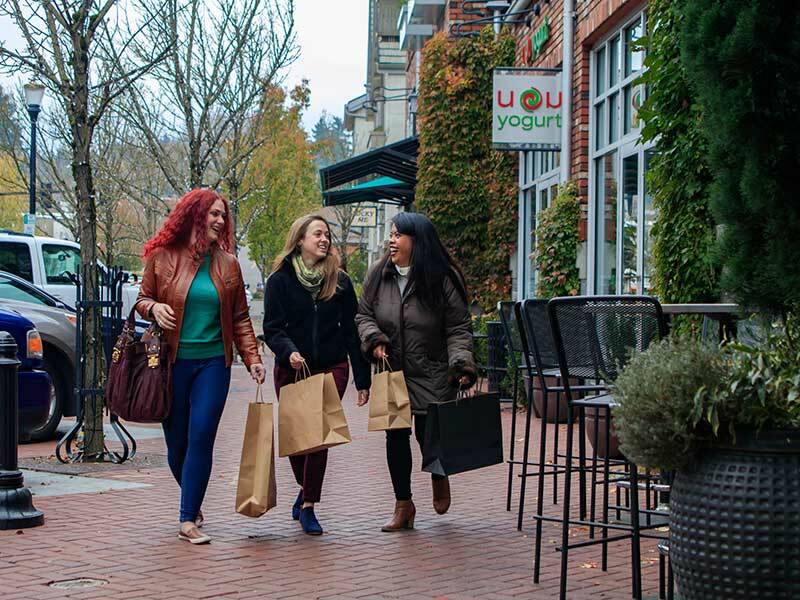 To take part in a more traditional shopping experience, head to downtown Lake Oswego. You'll find storefronts of all types, delicious eateries and public art displays that will have you wanting to make a whole day of your shopping visit. Lake View Village is a particularly scenic stroll, reminiscent of an old town square, with a tremendous selection of stores and restaurants, all on the water's edge. Chances are you'll need to hit at least one mall. Fortunately, we have you covered there. Clackamas Town Center has everything a mall should: name-brand stores mixed with unique local shops conveniently located right off of Interstate 205. If all of these options aren't quite enough to get you excited for shopping, remember that it's completely tax-free. With all those savings, perhaps you can get yourself a little something special as well. Better yet, grab some friends and make a whole weekend of it.